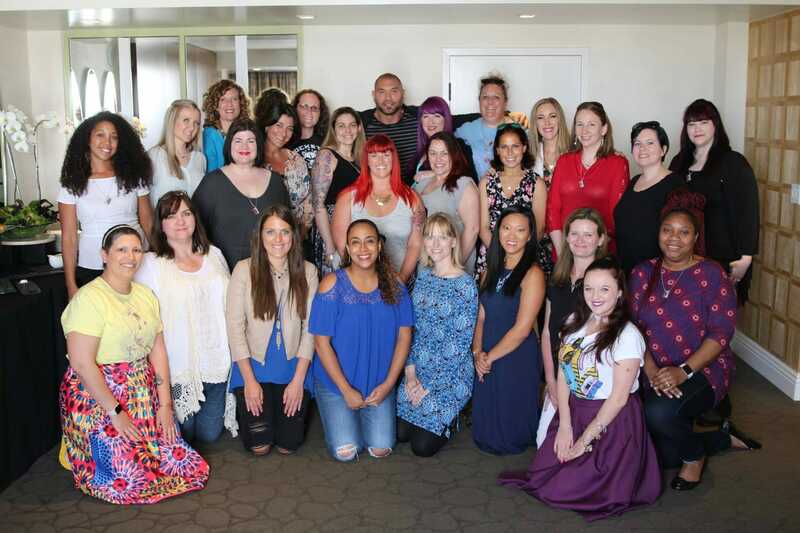 Last month I had the privilege of attending the #GotGVol2Event hosted by Disney/Marvel. Myself and 24 other bloggers had the opportunity to interview cast and crew from the movie. I admit that I expected Dave Bautista to walk in the room liked he owned it. I expected this larger than life personality that kinda fits the large package, but I was thrown off a bit when he was embarrassed by the applause and looked a bit uncomfortable sitting in front of the room. 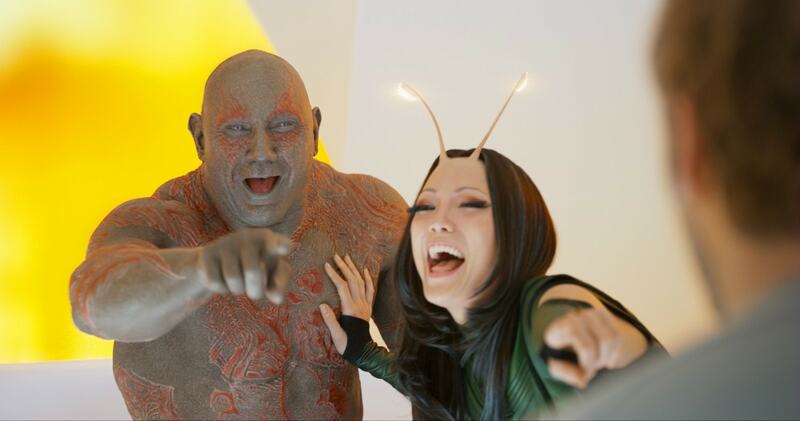 Dave Bautista isn’t really like Drax, the character he plays in the new film Guardians of the Galaxy Vol. 2, he is quite and soft spoken and so incredibly humble. As I listened to Dave talk, I realized that this is someone who has to overcome a lot of his fears in order to do what he is passionate about. That is extremely difficult for anyone to do, I can relate a lot to his struggles and I became a huge fan of his in the course of the 15 minutes he talked with us. Dave opened up about the script, his character, his insecurities and a little bit about the Guardians joining the Avengers. Dave was a little disappointed about his part when he first read the script. He likes to read over his dialogue when he first gets his script for a movie. I was expecting them to go a different direction with Drax. I thought he was gonna be more of the destroy. I thought he was gonna be a more comic book Drax…they were digging more into the funny bits. And I don’t find myself funny at all, so when I was reading these lines I was like they’re not funny. And I just didn’t really get ‘em. He told us that he thought the script was great, deep and emotional, but he was still a little disappointed about his part. But that changed on the first day they did the table read. The first day we did our table read, I realized it was hysterical. I just had a completely different outlook on it as a whole. Sometimes we just have to see the big picture to figure out where we fit in! Dave loves Vol.2. and thinks that it is a better movie than the first. I think it’s beautiful. I like it’s better than the first film. It’s weird. It’s one of those things, I feel like the more and more we get into film, the more I am sucked into it and there’s certain beats… I just get so emotionally invested in this film. I felt that the first one I thought was fun and exciting and some parts were very emotional, but not like this one. Dave doesn’t like seeing himself on screen. He is very self-conscious and watching himself is hard for him. I just cringe. I just like don’t watching myself on film. It’s just uncomfortable. And last night at the premiere every time I was on the screen like and I knew I was gonna say something, I just kinda put my head down and just try to get through it. I just don’t like it. I’m just uncomfortable with it. He said it helps a little when the crowd seemed to enjoy his lines. We assured him that we think he is fantastic as Drax. 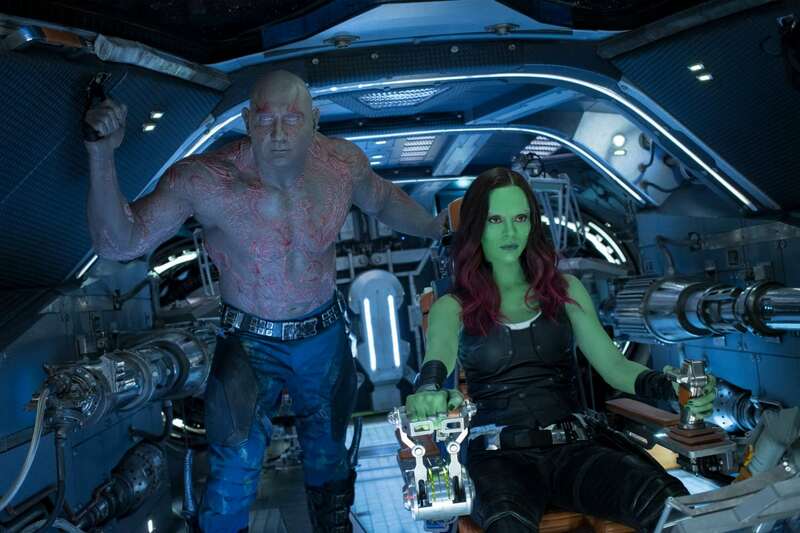 Should Drax have a Romantic Relationship in the Future? Vol.2 gives a hint to the audience that they are leaving a window open for a relationship for Drax in the future. We talked to Dave about that and what his thoughts are on that. Drax lives for his heartbreak. You know, he’s just too heartbreaking. I don’t think he’ll ever have a romantic connection with anyone. As you may know, David Bautista was a former wrestler and lot of people are familiar with him from that arena. We asked him if that experience helps him when it comes to acting especially when it comes to a character that is physically strong like Drax. Not really, but, you know, someone said something to me the other day that kinda resonated a little bit, and I never really put any thought into it. He was making the comparison, and I said there’s no comparison. I said wrestling is so big and so broad and such a big, you know, improvisational physical performance and acting is so intimate. 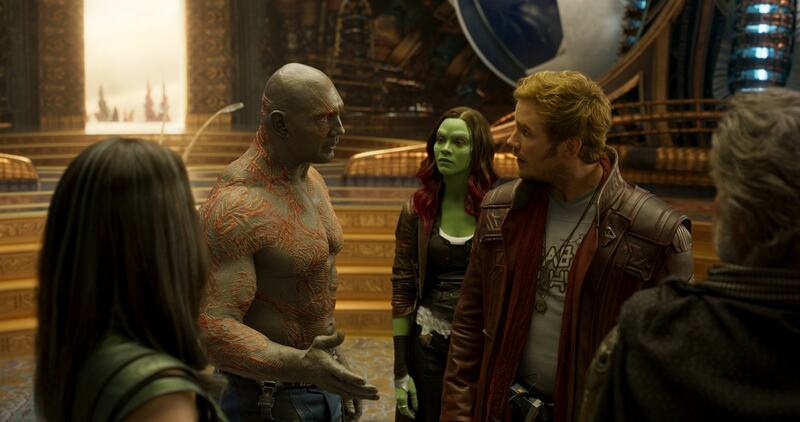 He goes, yeah, but Drax is so big. He’s so larger than life. And I never really thought about it, but it really is. So, maybe subconsciously it does help a little bit, ’cause Drax is definitely not who I am. He’s big and boisterous and a little bit egotistical and proud. And I’m not that. I’m self-conscious and understated. I just never really thought much about it and I never put it in that perspective. But, yeah, maybe it does have something to do with it, especially when Drax starts laughing. It’s just so big and ridiculous. As we all know by now, there is going to be a Guardians of the Galaxy Vol. 3 so there is going to be a future storyline for all of the main characters in GOTG. We asked Dave about it and what he would like to see for his character in the future. You know, if I had some input in it what I’d really love is for people is to have a visual, a face, a name to put with a face. I’d love if they would actually show Drax’s family. You know, some of the race of beings that he comes from. 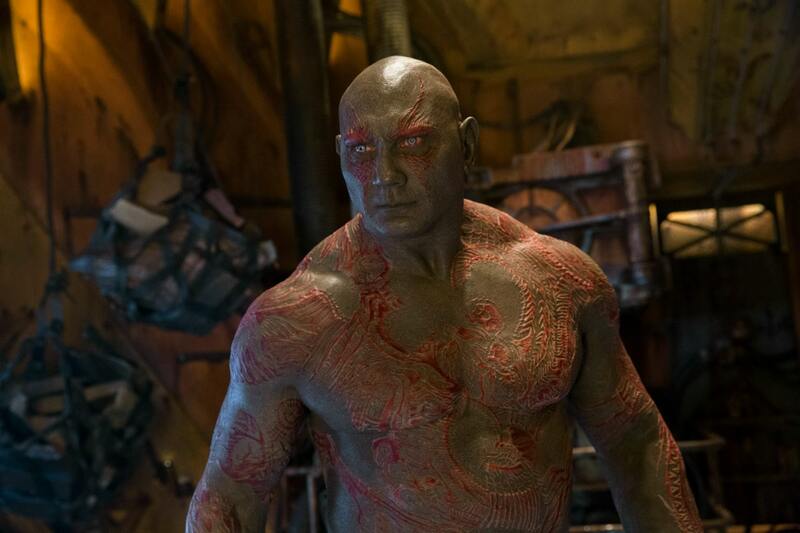 I’d like to see more Drax, more people with different tattoos and just that race of people. But I’d really think it would be great if the audience could just have a visual of Drax’s family. But as far as storylines, yeah, I have no idea on that. I agree with Dave, I would love to see more of the origins of Drax and see more of why he is the way that he is. Vol.2 does that a little bit for other characters and so maybe they are waiting for Vol.3 for Drax. Of course, we had to ask about the Guardians collaborating in the new Avengers Film out next year. I would love the spill the beans. I can tell you that we’re in the Avengers. But here was my fear going into the Avengers was that they were gonna try to make us into characters that we weren’t, they were gonna take their Guardians and try to go with that and not let us be James Gunn’s Guardians. And it was completely opposite. We had the luxury that James did a lot of the writing for us. And also when we showed up the Russo brothers were just so encouraging of us being our characters. We have a certain way of doing things. I mean we’ve done two films. We just bounce off each other. Chris hardly ever says anything that’s actually on page. He says it a bunch of different times and a bunch of different ways. That’s just the way we do things. We bounce and we’re very flexible. And they were just very encouraging of just letting us do things our way. Not only that but they really liked it. A lot of times we would say something that wasn’t even on page, wasn’t even close to what was on page and they’d come running on, “what was that you said on the last take?” And we’d say it again. They’d say, yeah, do that again. They just kinda let us be ourselves, man. It was great. I go home to Tampa and I hide. We chuckled, but he went on to explain that he doesn’t like being in the spotlight, the reason he does it is inspiring! I’m very content there, ’cause like all this attention and the spotlight very uncomfortable for me. Nobody really gets it, when we’re walking like down the red carpet and they’re saying, oh, this is great. And I’m like for me it’s not. I don’t hate it, but at the same time it’s just overwhelming for me. And I think a lot of people have a hard time relating why that would be overwhelming, especially when they look at what I’ve done for a living, with wrestling and everything being out there in the spotlight. I did it, ’cause I love it. I was passionate about it. That doesn’t mean I was always like super comfortable. I did it because I wanted to step outside of my career zone and pursue my dreams, which is terrifying. I admire anyone who chases their dreams. I am very glad that he doesn’t let his shyness or self-consciousness stop him from doing what he loves. It’s very inspiring! « Who is the Wonder Woman in Your Life?